At NAB 2012, Adobe launched a highly anticipated version of the Creative Suite. The new CS6 includes a make or break rebuild of Premiere Pro, its potent NLE that seeks to expand upon its base and capture those disappointed, professional Final Cut users feeling bereft upon the Version X upgrade. The release of CS6 is important. I’m currently preparing an in-depth review of Production Premium CS6. So for now, we wanted to share our view of this breaking story, touching upon some of the developments we see as crucial. To start, you can hear about Production Premium CS6 from the folks at Adobe involved in the product’s development. Watch the video report Dan Ochiva and I made during a recent visit to Adobe’s New York City offices. We were briefed about CS6 with the product managers for Production Premium (see below). Let’s start with After Effects, Adobe’s ubiquitous and versatile motion graphics and compositing software. 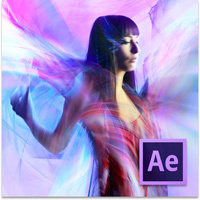 CS6 contains an impressive upgrade to After Effects and there are a lot of things to like. Here is some of what’s new. When designing motion in After Effects, it’s important to check your work often. This is currently accomplished by rendering the frames into RAM in a process called caching, then playing them back in real time. In CS6, Adobe has rethought and re-engineered the whole process of caching. The result is a much more responsive experience. The new caching techniques are called the Global Performance Cache, which include a global RAM cache, a persistent disk cache, and a new graphics pipeline. With the Global Performance Cache, After Effects CS 6 users won’t need to re-render the frames every time a slight modification is made to a comp. Rather, reusable frames are identified anywhere on the timeline, on duplicated layers and in compositions. With the persistent disk cache, you can reopen a previous project and find the rendered cache still intact. You can also render and cache a composition’s work area to disk in the background while you work on something else. Another new feature that caught my attention right away was After Effects’ exciting new capability to create enhanced 3D graphics and animations. While versions of After Effects prior to CS6 already had the ability to incorporate a 3D camera within a comp, add lights and move things around in x, y and z space, it was not a truly 3D application (more like 2.5D). Text and graphics were flat, as if they were made from paper-thin planes. Working with After Effects was thus more akin to shooting with a multi-plane camera such as the one that Walt Disney invented where layers were painted on various offset sheets of glass to give the illusion of depth to a scene resulting from the parallax of flat planes. To create sophisticated 3D graphics and animations, you needed a true 3D application such as one from Autodesk (3D Studio, Maya, or Softimage) or Maxon’s Cinema 4D. The latter program has, in fact, emerged as perhaps the most popular app employed by After Effects users due to its tight integration with that software as well as unique features such as Mograph (C4D’s cloner toolset). While Adobe’s suite of applications offer so much to so many, up until now it had little available for creating advanced 3D graphics animation. That’s been a little puzzling, since Adobe isn’t exactly a stranger to 3D. Adobe Dimensions, for example, was a vector-based 3D program the company once published but then discontinued. You can also find 3D functionality within Adobe Illustrator and Photoshop. Even so, these options did not go far enough for serious motion graphics artists and animators. (Over the years third party plug-ins such as Zaxwerks 3D Invigorator helped bring more sophisticated 3D capabilities to After Effects). Could the decision to now offer more sophisticated 3D abilities in After Effects be Adobe’s answer to 3D? To what extent will After Effects users need to rely on separate 3D apps like Cinema 4D? I will address these questions more fully in an upcoming review. For now, let us survey the new 3D features in After Effects. AE CS6 has a new ray-traced 3D rendering engine that can handle reflections, transparency and refraction. With it you can bevel and extrude text and shape layers. Environment maps are also supported. You can use these to easily generate interesting reflections. The renderer supports motion blur along with soft shadows, depth of field and intersection of layers. The new ray-tracing engine also reproduces effects such as light transmission and light streaming through a stained glass window. Use a qualified NVIDIA graphics card and you will greatly accelerate rendering times of those ray-traced 3D compositions. For example, the addition of even an entry level Quadro 2000 accelerates the render by a factor of ten. Spring for a high-end Quadro 6000 and rendering can go 50x faster. The new 3D abilities in After Effects are important and will evolve from this impressive beginning. Adobe reps point out that the addition of 3D into After Effects is a “foundational change”. I would expect future releases to implement features such as revolving (or lathing) of vectors as well as global illumination (GI). After Effects probably won’t eliminate the need for a fully featured, dedicated 3D application anytime soon though. I’m not sure subdivision surfaces, character modeling, rigging or UV texture mapping is on Adobe’s agenda (at least not yet). However, with its ray traced rendering and true z-depth geometry, AE might be all you need to create flying logos or broadcast designs which take place in slick 3D environments. 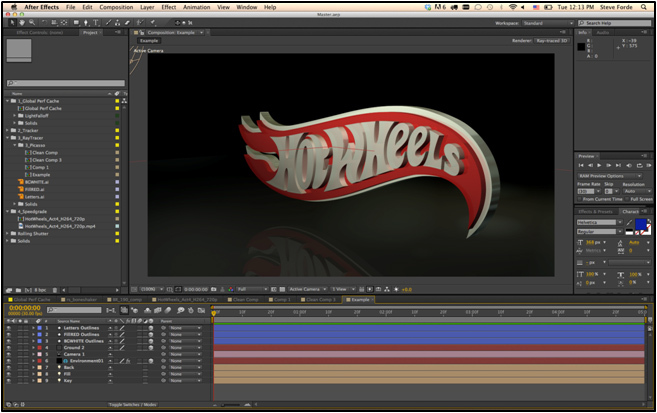 2D motion tracking has long been a feature of After Effects, and techniques such as corner pinning gave the illusion of a 3D track. But to achieve true 3D motion tracking, one needed to rely on 3D tracking programs such as SynthEyes, Boujou or PF Track. This has now changed with AE CS6 addition of a 3D camera tracker within After Effects. The 3D motion tracker can analyze the motion of the pixels in footage and compute the camera’s position, orientation and field of view and apply those settings to a new After Effects 3D camera. That’s a great boon to visual effects artists and compositors. You will now be able to insert elements in 3D space in your scene and seamlessly integrate them with the footage, regardless of how shaky or mobile the camera was employed to shoot. Need to affix a painting on a wall? No need to rely on corner pinning anymore. What about a stop sign on the side of the road? You’re covered. In addition, this opens up the possibility of 3D data computed by After Effects’ 3D motion tracker to be exported to cameras in outside 3D packages (such as Cinema 4D), possibly turning After Effects into an all-purpose 3D motion-tracking app. CS6 also boasts tighter integration with Adobe Illustrator. Now you can click on an imported Illustrator layer and convert it into an After Effects shape layer. By doing so, you can modify its fill and stroke as well as change or animate its vertices. Also, let’s not forget that shape layers can be extruded into three-dimensional forms. The 73 Cycore plug-ins bundled with After Effects have been updated to support 16-bit color. Additionally, 35 of them support 32 bit floating-point calculations, crucial in today’s compositing environments. Other enhancements to the Cycore effects include support for motion blur and awareness of a composition’s 3D lights when needed. After Effects now also has the ability to work with high dynamic range footage such as ARRIRAW files. Adobe’s purchase of Automatic Duck has resulted in Pro Import After Effects, which allows you to import files from Avid Media Composer and Symphony as well as XML files from Apple’s Final Cut Pro 7 or earlier versions. You can then work with them in AE. Even before the rumblings of discontent that surrounds Final Cut Pro X, I personally had adopted Premiere Pro as my NLE of choice. Not the least of the reasons was the Mercury playback engine, 64-bit native operation, true cross platform interoperability and tight integration with the rest of the Creative Suite, particularly After Effects. 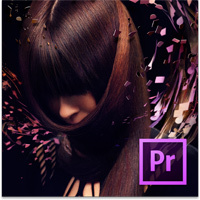 Premiere Pro CS6 is a major upgrade to this already highly capable NLE and this latest version adds features addressed to people who make their living as editors. While many professional editors have stayed with Avid Media Composer through thick and thin, Premiere Pro seems to be well poised to make major inroads into that market and recent sales figures released by Adobe attest to vigorous growth. There are some compelling reasons for that: Premiere Pro CS6 features a completely redesigned user interface offering a clean, uncluttered look. New monitor panels can be reconfigured on the fly, a new audio mixer packs the sophistication of the one seen in Adobe Audition, and new project panel views configure with large thumbnails of your footage that allow you to easily create in and out points. Adobe Premiere Pro CS6 also includes new keyboard-driven workflow enhancements. For anyone editing for eight to ten hours a day, this contributes much to your productivity. Trimming within Premiere Pro's redesigned interface. Warp Stabilizer, introduced in After Effects CS5.5, now comes in Premiere Pro too. With this useful tool, you can take shaky camera footage and make it look like it was filmed with a Steadicam. 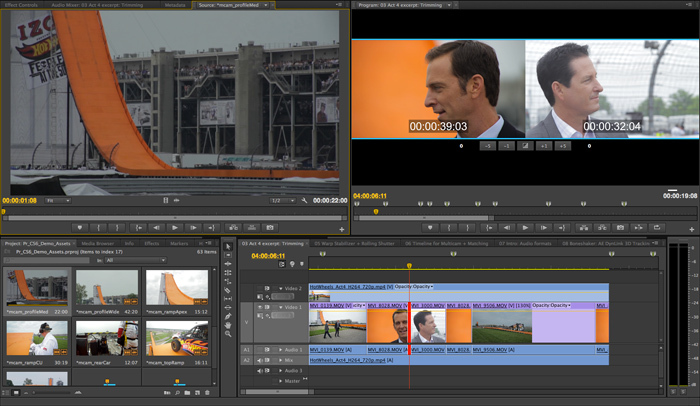 Premiere Pro CS6 also sports improved multi-cam editing abilities. Useful when dealing with live events where many cameras were used to shoot various angles, CS6 multi-cam support now allows you to draw from as many cameras as you want. Previously you were limited to four. Adobe’s powerful 64-bit Mercury Playback Engine has also been improved. You’ll now get smoother playback and scrubbing through multilayer, multi-format sequences, whether it’s HD, 4K or even 5K footage with multiple effects applied. Aside from the massive power obtained from the NVIDIA Quadro family of GPUs found on such powerful workstations like HP’s Z820, The Mercury Playback Engine now also supports OpenCL-based AMD Radeon cards (used on Macs). Already lauded for being able to understand a wide variety of camera formats without the need for transcoding, Premiere Pro CS6 now includes support for several new and important camera formats. These include native support for ARRIRAW footage shot with ARRI Alexa cameras at HD and 2K resolutions, RED R3D and RMD files (including 5K resolution footage) shot with RED SCARLET-X and RED EPIC cameras and support for Canon XF MPEG-2 50 mbps footage shot with Canon Cinema EOS C300 cameras. Just drop the footage in the timeline and start editing. Production Premium CS6 also includes a new application called Adobe Prelude, which was made specifically to ingest and log your footage. This is useful in managing the mountains of file-based media that is often generated during large productions. You can also use it to create rough cuts, mark in and out points and add searchable markers, comments and tags to your clips. All that information is stored as metadata in your media files, which flows directly into Premiere Pro when you import the files. An important new feature of Production Premium CS6 is the new application called Adobe SpeedGrade. While Premiere previously offered some decent tools for color correction such as three-way color grading, full-time colorists turned to separate, dedicated color grading apps to do the job. Now that’s changed. At IBC 2011, Adobe announced that it had acquired key assets of German company IRIDAS, a well-regarded creator of high performance tools for color grading. 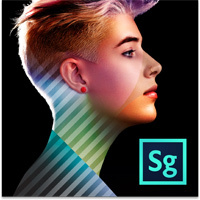 Adobe kept the name SpeedGrade, and made it an important part of Creative Suite. We had a chance to check out SpeedGrade in a demo not long ago at Adobe’s offices in New York. We came away impressed by its advanced feature set, once the domain of professional colorists. In addition, you can easily “round-trip” with the app: import an entire Premiere Pro timeline using Premiere’s new ‘Send To SpeedGrade’ command, work on the color and send it back. There are also tools for HDR, film-style filters and 3D work. This is a big release. There is much more to CS6 than I could have mentioned here. For example, we haven’t discussed Audition, Adobe’s extremely versatile audio program (for more info, check out our interview with product manager Ellen Wixted). Of course, we also didn’t mention anything about the latest changes in Photoshop, Illustrator or Encore — all software that plays a key role in the production and post industry. I’ll save that for later. Until then, you’ve got a good excuse to throw a party.